Pink Lemonade Stand by LemonShortbread: ARTCARDIST.COM FEATURE! Why art cards? Well this is an easier reference to 2.5 x 3.5" artist-created cards that can function both as ACEOs or ATCs. Usually ATCs are strictly for trading without intention to sell and ACEOs are strictly created for selling. Ditto if you are planning to join a specialised collector's club or forum. For people who don't want to choose a side (like me), the term 'art cards' is more convenient and speaks for itself, although I am currently only creating ACEOs. Everywhere else outside my Etsy shop/Ebay/blog I always call ACEOs 'Art Cards' anyway because no one understands what the acronym means! 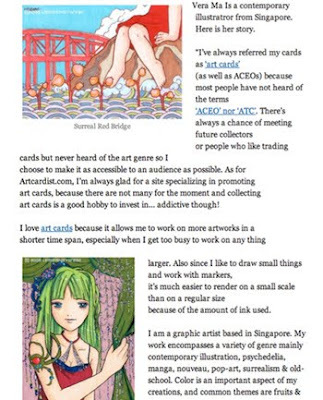 For the uninitiated, ATC means 'Art(ist) Trading Cards' and ACEO means 'Art Cards, Editions and Originals'. Many thanks to Corey Brown for taking the time to create the feature! Way to go, that's great! Congrats...that red bridge one is fabulous! Congratulations on the exposure! I want to start collecting ACEOs. I'm always so impressed with the ones I see online, and I think it's a nice, affordable way to collect little pieces of art. Really like your blog . your are welcome to vitse our blog. So happy for you and the write up. You know, I never heard of this type of card, till I started blogging. They are really neat.